[Montréal, Québec, Canada 18°C] When I heard that Stefan Christoff was preparing for his second photo exhibit, I knew I had to go. His first one displayed photos from a trip he made to Lebanon. I bought one of the photographs in the exhibit of an image of Yasser Arafat stencilled onto a decaying wall in Burj el-Barajneh Palestinian refugee camp. To me it symbolizes the dire circumstances faced by Palestinian refugees: a fading leadership, constant colonial encroachment and oppressive living conditions. It now hangs on my living room wall as a reminder that, despite its singular beauty, occupation is reprehensible. I was looking forward to seeing his most recent exhibit, On Movements in Manila, and took the opportunity to attend the September 11 vernissage. During a visit to the Philippines in 2007 as an elections observer, Christoff met with many political groups and was inpired by the level and intensity of the grassroots social organizing he encountered in some of slum areas of Manila. Lucky for those in attendance at the vernissage, Christoff provided a guided tour of the exhibit. He offered a spirited introduction of Philippine political culture as it is practiced among the poor. In the final article that Christoff wrote as part of his three-part At the Ballot Box about his trip to the Philippines, he wrote, “Economic inequality is a central element fueling political turmoil and grassroots rebellions in the country.” According to United Nations figures, approximately 15 million people in the Philippines live on less than US$1 per day. An international elections observer from Thailand compared these 2007 mid-term elections in the Philippines with his observation of Afghanistan’s 2005 elections, stating that polling conditions were worse in the Philippines. Not exactly a favourable commendation. According to Amnesty International the Philippines has one of the highest rates of politically-motivated murders in the world, with an estimated 860 killings since current president Arroyo took office in 2001. Although international observers cannot prevent election irregularities, nor stop politically motivated violence, foreign delegations tend to reduce both by their presence. A member of the Centre for Philippine Concerns, spoke about Canadian relations with the Philippine Army. For details, refer to Christoff’s three-part article. As Canadians who receive thousands of Philippine women each year as part of the Live-In Caregiver Program between the Canadian and Philippine governments, we should be aware of the situation in the Philippines that leads so many women to seek work in Canada and elsewhere, often living for years without permanent legal status. The poverty portrayed in Christoff’s photos provide some insight into probable reasons why so many women leave the country to earn a living elsewhere. In fact, the portion of their income sent back to their families in the Philippines accounts for an important portion of the national GDP. 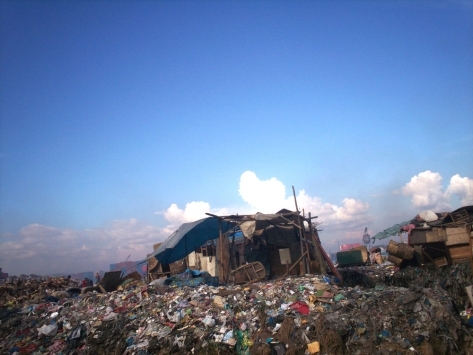 The photographs of a community living on top of metres and metres of garbage at Smokey Mountain exemplify the extreme economic disparity between the wealthy, who produce much of the garbage in the city and the desperately poor who live a meager existence directly off the refuse. This disparity may be the leading cause of increasing political unrest, the emergence of grassroots support of revolutionary politics in urban areas and guerrilla movements in the countryside. Christoff says the exhibit “offers images that attempt to capture the mood of a country struggling against intense poverty, state corruption and for national liberation.” It also offers a chance to visit a part of Manila that most visitors to the city would never otherwise get the opportunity to see. That’s why we need to choose the right people who leads our country.